Although plugins allow you to integrate new functionality into the WebApp, showing the user some information in a simple UI component in the 'Zarafa' tab or sidebar on the right might be quite useful as well. Think for example about the "Today's Appointments", "Facebook" or "Clock" widgets. Even more advanced functionality is possible where the user can play a game ("Shell game" widget) or create a new mail or appointment ("Quick Mail" and "Quick Appointment" widgets). 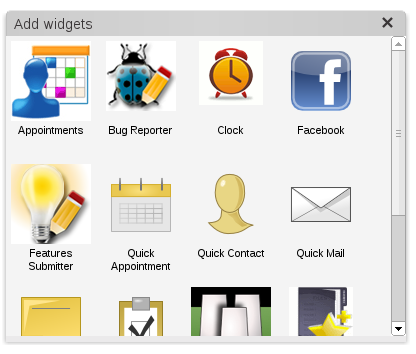 In this Blogpost, we will go deeper into the Widget system, and how a widget can be created. To describe the functionality and API for the widget, we will be going to use the simplified version of the "Unread Mail" widget which was recently released. The second argument to the registerWidget function is the unique name of the widget, the last two argments are the display name and the path to the icon as should be shown in the Widget Dialog where the user can select the widget he would like to activate. IMPORTANT: The `set` and `get` functions cannot be used before the `Zarafa.core.ui.widget.Widget` constructor has been called. 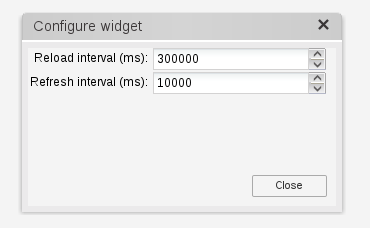 If the settings are needed during the creation of the widget, they should be requested during the `initWidget` call as shown above. The code above will open a new Ext.Window instance, where the user can control the reload interval option. As soon as the user starts changing the value, we directly apply the value to the settings using the `set` function. // Wait for the hierarchy store to be loaded. This ensures that immediately when the hierarchy is loaded, the store will be loaded with all the mail items from the given folder. Please refer to the `ListModuleStore` API documentation for additional filtering options, where either the amount of data as loaded from the server can be reduced (using the `setRestriction` function) or the amount of displayed data is reduced (using the `filterBy` function). This will create a grid (an instance of `Zarafa.common.ui.grid.GridPanel`), which will show a load mask when the store is busy loading the mail from the server. When no mail was found in the folder, then the message 'No unread mail' will be shown to the user. Finally the Ext.grid.ColumnModel describes which columns should be shown to the user, currently we will be showing the "From", "Subject" and "Received" columns. For formatting of the contents of the Columns, please refer to the `Ext.grid.Column` API documentation. Although we didn't show the exact implementation of the "Unread Mail" widget, this blogpost has hopefully given enough inspriration on the creation of Widgets, and how they can be used to display information that is of interest to the user. Widgets can be made as simple or as complex as the developer wishes. They might obtain data from the Zarafa system, like the widget in this example, or obtain them from them from another website like the "Facebook" and "Twitter" widgets.